Can the dream of sustainability become reality? In November 2014, a two-day Green Economy workshop was held in order to identify environmental priorities in TCI. Representatives from government, science, watersports, fisheries, local communities, and tourism met to discuss what current policies are working well for TCI’s environment and what further work is needed to foster sustainability. 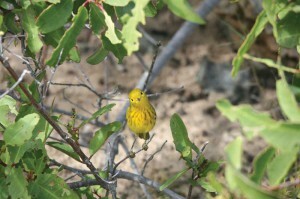 This curious yellow warbler flits through Salt Cay’s bush. The messages coming forth from the workshop and stakeholders were clear and represented a consensus of opinion. TCI’s economy is precipitously poised on maintaining the country’s ecological assets, and as a country, we must ensure the welfare of the environment is maintained or face dire consequences. Limited natural resources, poor topsoil, and scant rainfall limit TCI’s potential for most industries; therefore, the natural beauty of crystal-clear waters, white sand beaches, and teeming coral reefs represent the country’s best saleable commodities. Hotel and restaurant receipts alone directly provide 34% of GDP, and indirect economic effects may account for as much as 80% of the country’s economy (Batas & Forbes, 2007). Unfortunately, tourism and other development often come with associated environmental costs. Resorts generate solid waste and sewage effluents that can threaten or kill marine organisms. Dredging for marinas can result in physical destruction to and sedimentation of coral reefs and seagrass beds, and rapid development can result in the clear-cutting of pristine terrestrial habitats, resulting in a loss of habitat for rare, threatened, endangered, and endemic species. 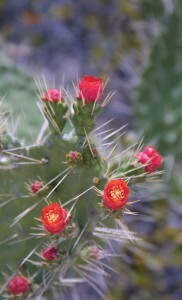 You know spring is near when the cacti dotting much of TCI’s lush “bush” blooms. TCI is caught in a delicate balancing act to foster economic development, while at the same time ensuring that such activities do not compromise the environmental values that underpin the entire economy. TCI is not alone in this vulnerability. The United Kingdom’s Overseas Territories (UKOTs) possess a staggering 94% of the UK’s endemic or unique species (Churchyard et al., 2014), yet with few exceptions, these small island states suffer from pandemic sustainable policy failure (Mycoo, 2006). In order to address these concerns, the UK’s Joint Nature Conservation Committee (JNCC) launched an Environmental Mainstreaming or “Green Economy” process in order to assist individual UKOTs in identifying priority issues that would enable countries to integrate environmental concerns into all aspects of developmental decision-making. In early 2014, the Ministry of Environment and Home Affairs and Department of Environment and Maritime Affairs (DEMA) expressed an interest in launching a TCI Green Economy Project and were awarded permission to do so. The process was fully funded by the UK Foreign and Commonwealth Office (FCO), Department for Food and Rural Affairs (Defra) and JNCC, and preliminary work on the project commenced in October 2014. Dialogue Matters, a U.K.-based company that aims to transform the way people work together around the management and use of the natural environment, was awarded the contract for the project. Dialogue Matters was established in 2000 and specializes in delivering the best possible stakeholder dialogue, using a participatory and user-friendly approach to research and reporting. Their workshops are intended to inspire environmental action and to foster momentum to transform how stakeholders engage with one another as they steer towards best practices. The first order of business was an exhaustive review of existing environmental research, legislation, and capacity of government and non-government organizations. A total of 42 documents were reviewed in this process and a spreadsheet of environmental inventory and gaps was developed. Next, a project oversight group (POG) was appointed, with members from key stakeholder groups, such as government, the private sector, and non-governmental organizations. In a separate workshop for POG members, key environmental issues and stakeholders were identified. Finally, a workshop with 32 attendees took place in November. Through a series of hands-on activities and discussion sessions, participants identified key environmental priorities and developed action plans to implement them. • Determining mechanisms for non-governmental organizations (NGOs), government, and the private sector to work together more effectively, including establishing a new NGO to forward all environmental objectives. With these seven priorities clearly identified and agreed upon, it is now up to the people of TCI to move these matters forward. While some of the priorities will involve identifying funding sources, work towards some of the above initiatives is already underway. A Green Economy Working Group (GEWG) was established and met for the first time on January 29, 2015, and another meeting took place on February 5 to commence work on establishing a dedicated environmental NGO. Discussions are underway to improve solid waste management in TCI, including a discussion on banning plastic bags and Styrofoam packaging. Some GEWG members are also looking into how sustainable energy policy has been implemented in other UKOTs. A primary goal of the TCI Green Economy project is to empower people from all walks of life to take ownership of and responsibility for the environment that sustains us. The ball is in our court. A green, beautiful by nature future for TCI can be a reality. 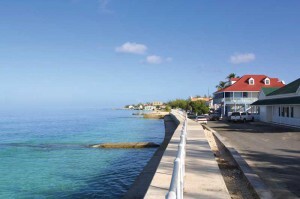 Grand Turk’s historic Front Street reflect centuries of island history. A preliminary TCI Green Economy website has been established at http://tcigreeneconomy.weebly.com. Any person interested in participating in the TCI Green Economy Working Group should contact Kathleen Wood at kw@swa.tc in order to be added to the Working Group mailing list. Batas, M., & Forbes, K. (2007). National Accounts Statistics In D. o. E. P. a. Statistics (Ed. ), (pp. 80). Turks and Caicos Islands: Statistical Office – Department of Economic Planning and Statistics, Turks and Caicos Islands Government. Churchyard, T., Eaton, M., Hall, J., Millett, J., Farr, A., Cuthbert, R., & Stringer, C. (2014). The UK’s wildlife overseas: a stocktake of nature in our Overseas Territories. In R. S. f. t. P. o. Birds (Ed. ), (pp. 76). Sandy, U.K.: Royal Society of the Protection of Birds.